I ended Day 5 at Lake Ogallala State Recreation Area. Camping at a recreation area is very different from camping in a state or national park. You pay admittance ($10 in this instance) and just drive to wherever you want to overnight. Lake Ogallala is gorgeous. I parked right on the beach under the trees and prepared for the night. After unloading my kayak, chair, cooler and other items I drove to the only restaurant in the rec area. It was 4:00 but I thought I would treat myself to a cocktail and a hot meal. The sign read that the kitchen didn’t open until 5:00. OK, I’ll sit at the bar and enjoy a glass of wine until it opens. I ordered my wine and told the bartender I’d just sit and keep her company for an hour until I could order dinner. She said, “Nope, that’ll be two hours”. Well, I had crossed into another time zone and it was actually 3:00. So, now I’m two zones away from home and I’m a little confused because I don’t know how to re-set my fit bit watch and I’ve been deducting an hour every time I glance at it. OK, so now I’ll deduct two hours. But I’m still hungry. I bought a bag of Doritos and a bag of Cheetos (actually the first junk food since I began my trip – hooray for me!) and returned to the lake. 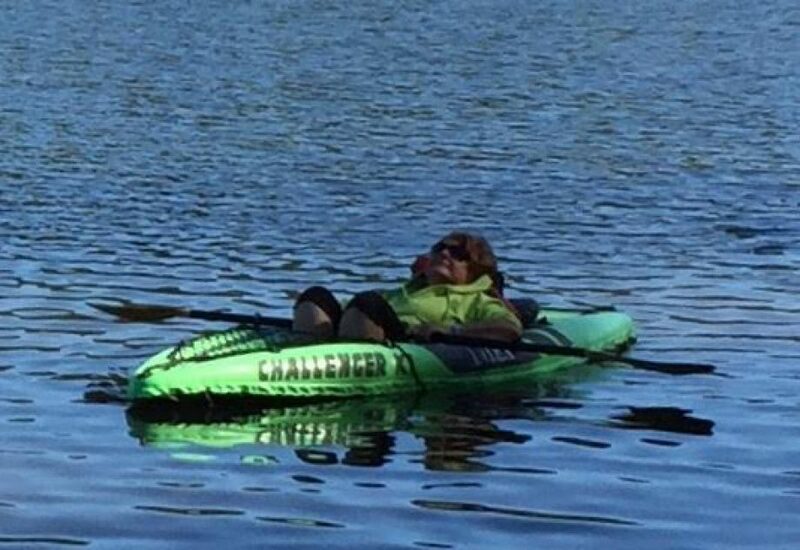 I inflated my kayak and had a wonderful paddle on Lake Ogallala. I decided I’d do an early morning paddle so I left the kayak inflated, sat down to write, read, drink some wine (I always carry a bottle for happy hour), plan the next day’s route, munch on junk food and watch the sun set. Stunning. There’s one problem with camping in a recreation area – no facilities. Well, there was a vault toilet but yuck, no. I used my female urination device for the first time and it worked great although my sister-in-law’s method of outdoor peeing worked even better. Thank you, Lisa. Contact me if you want her method. I don’t mean to be offensive but these are things girls must think about when camping. I had a very comfortable night except that my eye started draining. After cleaning it with a washcloth and water, it began to feel better and by morning the pain was gone and the swelling under control. Whew! No kayaking in the morning. The lake was shrouded in mist. I sat on the dock dangling my feet in the icy water while making some phone calls. The setting was quiet and mysterious and I started thinking about Stephen King’s, “The Mist”. I got extra spooked when I heard a splash and promptly pulled my feet out of the water and up into a lotus position but reminded myself that there are no sharks or alligators in Lake Ogallala. It still creeped me out until I saw a large fish jump, wiggle and splash. It was a trout or a bass maybe and would explain why I saw a bunch of people fishing yesterday. I had a heck of a time deflating the kayak and getting it back up into the rooftop carrier. I brought a one step stool but I still wasn’t tall enough to position it, zip the carrier and tie it down. There was no one around to help so I just did a half-assed job and went on my merry way. I stopped at the Visitor Center to clean up, change clothes, a little makeup (hopeless since I didn’t want anything applied around my eyes), comb and style(?) my hair, etc. The hell with it. I was anxious to find Wyoming. The rest of Day 6 was glorious. I entered Wyoming early and was so enthralled with the scenery I passed right through Cheyenne and Laramie without really noticing. My plan was to stop and explore some cowboy stuff but I decided I was more interested in the countryside than tourist attractions so I kept driving west on Interstate 80 until I discovered a byway through the Medicine Bow Mountains. It took me two hours off my route but was so worth it. I then got desperately lost but eventually found Rawlins, WY and decided that I would boondock for the first time at the local WalMart. Many of the camping blogs I read recommend staying at the WalMart lots because they’re safe and convenient. There are security cameras and lights and I was encouraged that there were at least 20 RVs, campers and trucks parked in the overnight parking area. I know it sounds odd to boondock in a WalMart lot but if it’s good enough for the big boys with quarter million $ RVs, it’s good enough for me. WalMart loves overnight campers because they buy their supplies from the store, buy gas, etc. Whatever you may think about WalMart, they are cordial and supportive of their overnight campers. I stopped for dinner at the Days Inn restaurant next door because I was exhausted and didn’t have the energy to look for any other restaurants. I had one of the most delicious cheeseburgers I’ve ever eaten. Perhaps I was just extremely hungry having only eaten leftover Cheetos and a couple of energy bars all day. I parked between two huge RVs and in the morning the lot looked like a regular campground. I felt secure and had a comfortable night. I can’t wait for Day 7 – Grand Teton National Park.